Warm dark brown vintage finish over replicated oak grain and authentic touch. Side roller glides for smooth operating drawers. 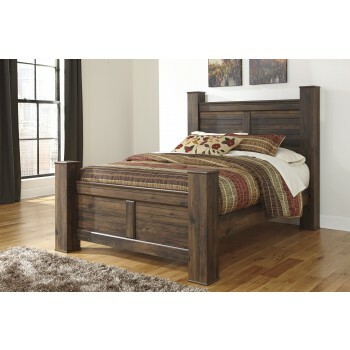 Large scaled rustic contemporary bedroom collection features case pilasters. Poster bed offers optional footboard storage. Slim profile dual USB charger located on the back of the night stand tops. Framed panels with horizontal slat details are used in the beds. The (49) includes an adjustable shelf that can be replaced by the W100-01,02 LED Fireplace Insert. Queen (57) and king (58) panel headboards can attach to a bolt on metal bed B100-31 or B100-66 respectively. Large drawers provide ample storage space. Headboard legs have 4 height options for optimal relationship to bedding height. Queen (64S) and king (66S) storage footboards feature ready to assemble (RTA) construction.